When it comes to meeting challenges, our response is simple: We serve. Our focus is the South Grand Lake community and focus on things that matter us, Senior Centers, Schools, Veterans Plaza, Eyeglasses and so much more. We do community volunteer work, through helping, leading, planning and supporting our community. Because we're local, we can serve the unique needs of the communities we live in. And because we're global, we can address challenges that go beyond borders. We empower the next generation. Whether it's providing youth volunteer opportunitiesand leadership experiences in a Leo club or sharing a message of peace through our Peace Poster contest, our youth programs invest in the future by reaching out to young people. If you’re interested in volunteering, leading projects, networking and having fun – you can do all of this and more as a Lions club member. As a Lion, you’ll perform local volunteer work to improve your community – and communities around the world. 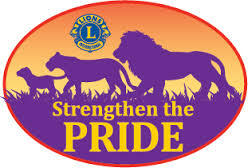 Talk any Lion member about joining the team and they will be happy to set you up and quide you as a Lion or contact President Virginia Gibson at 918.645.5941 for more information.